AFTER MY LAST FEW TRIPS TO ITALY I HAVE LEARNED WHY I SHOULD ALWAYS TRY TO KEEP THIS ARSENAL OF ITALIAN SPIRITS ON HAND. APEROL IS GREAT AS A SPRITZ, MIX WITH SODA GARNISHED WITH LEMON, A PERFECT LIGHT DRINK BEFORE DINNER THAT DOESN'T CLOBBER YOU. 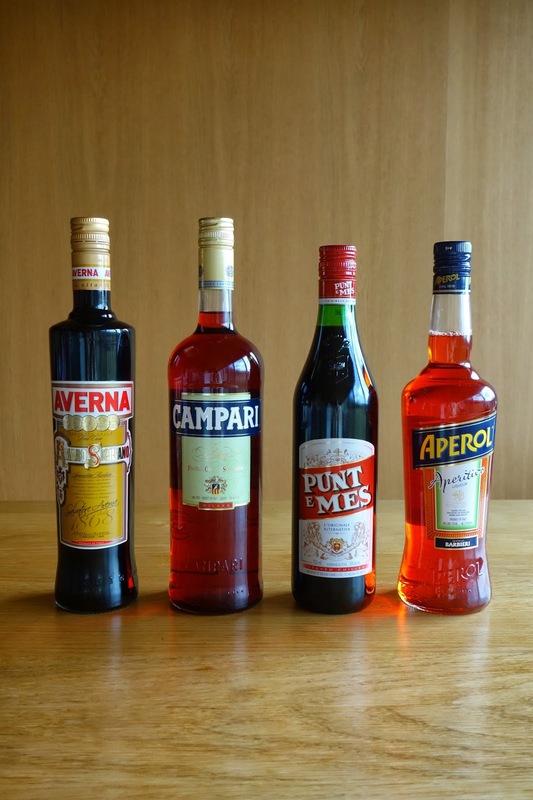 SAME WITH CAMPARI OR ADD THE PUNT E MES AND SOME GIN AND A SLICE OF ORANGE AND GET A BIT CLOBBERED WITH A CLASSIC NEGRONI OR TWO. FINALLY, EVERY OVER INDULGED MEAL SHOULD END WITH A SMALL GLASS OF AVERNA TO "AID " DIGESTION, SERVED STRAIGHT OR WITH ICE. SALUTE!